When you are sporting your CNLD tote and/or mug, you can be proud to know that you supported a movement that is all about love, justice, and peace. For too long, Disabled folks in Latinx communities have felt isolated and stigmatized. CNLD has brought folks together to celebrate our identities and to fight against the stigma. We exist because we resist. Existimos por que resistimos. Nos existimos por que nos resistimos. Image of the TeeSpring webpage selling the Disabled Latinx Tote. Image description of the tote: Black background. CNLD in stencil in white with paint dripping from it. Three bright red marigold flowers on top. Then "we exist cuz we resist" on top of the flowers in white with the X in red overlaying the flowers. The price is $19.99 and there is a green button that says "buy it now"
Image of the TeeSpring webpage selling the Disabled Latinx Mug. Image description of the tote: Black background. CNLD in stencil in white with paint dripping from it. Three bright red marigold flowers on top. Then "we exist cuz we resist" on top of the flowers in white with the X in red overlaying the flowers. The price is $14.99 and there is a green button that says "buy it now"
Image of the TeeSpring webpage selling the Disabled Latinx Tote (Spanish version). Image description of the tote: Black background. CNLD in stencil in white with paint dripping from it. Three bright red marigold flowers on top. Then "existimos por que resistimos" on top of the flowers in white with the X in red overlaying the flowers. 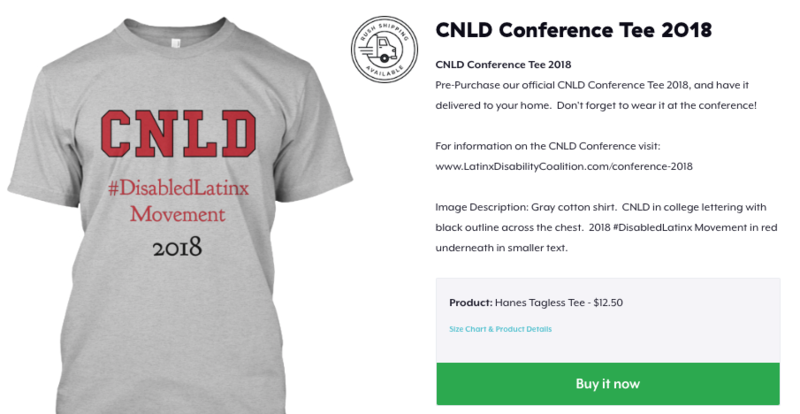 The price is $19.99 and there is a green button that says "buy it now"
Image of the TeeSpring webpage selling the Disabled Latinx Mug (Spanish version). Image description of the mug: Black background. CNLD in stencil in white with paint dripping from it. Three bright red marigold flowers on top. Then "existimos por que resistimos" on top of the flowers in white with the X in red overlaying the flowers. The price is $14.99 and there is a green button that says "buy it now". Image of the TeeSpring webpage selling the Disabled Latinx Tote (Portuguese version). Image description of the tote: Black background. CNLD in stencil in white with paint dripping from it. Three bright red marigold flowers on top. Then "nos existimos por que nos resistimos" on top of the flowers in white with the X in red overlaying the flowers. The price is $19.99 and there is a green button that says "buy it now". Image of the TeeSpring webpage selling the Disabled Latinx Mug (Portuguese version). Image description of the mug: Black background. CNLD in stencil in white with paint dripping from it. Three bright red marigold flowers on top. Then "nos existimos por que nos resistimos" on top of the flowers in white with the X in red overlaying the flowers. The price is $14.99 and there is a green button that says "buy it now".